Astrobiologists Gilbert V. Levin and Patricia A. Straat have published an op-ed piece (ICAMSR 8-21-17) commenting on an article in Science (DOI:10.1126/science.357.6351,2017) that downplays the hazards involved in NASA’s Mars Return Sample Program. The Science article, by staff writer Paul Voosen, also addresses the difficulty imposed on the Mars rover, Curiosity, in looking for life while avoiding the possibility of contaminating the red planet with hitch-hiking Earth germs. Click here to read Barry diGregorio’s BCAB press release. The two astrobiology veterans argue, with reference to the possibility that life has already been detected on Mars, for the “classical dictate of science: when an experiment produces a new result, repeat that experiment to check its validity, and, if it proves true, expand the experiment to gain new facts.” Their proposals to do just that have not been accepted. Click here to read Levin and Straat’s article, “A partically pregnant idea”. Max Wallis, Chandra Wickramasinghe and Steve Coulson gave a paper at RAS NAM2017 National Astronomy Meeting at the University of Hull: “Early Life Traces in the Hadean – compatibility with post-Accretion Bombardment”. They argue that bombardment of the early Earth by comets and asteroids created favourable conditions for primitive life rather than sterilising the planet. Click here to read the abstract. 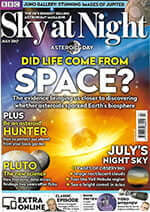 The July 2017 edition of the BBC’s Sky at Night Magazine has an article by Nick Spall: “Life from space: The debate continues” (pp.33-37), which is also featured on the front cover. It includes an introduction to the concept of panspermia, a survey of the forms it might take, and a summary of the evidence found so far. There is a debate about “Is panspermia possible?” between Professor Chandra Wickramasinghe, who says “Yes, definitely” and Professor Ian Crawford, who says “it has still to be proven”. An article by Shannon Hall looks at the cosmic grouping called TRAPPIST-1, where seven planets densely arranged around a star could exchange bacterial life much more easily than Earth and Mars. Professor Wickramasinghe compares it to throwing seeds in the wind: “a very few could take fruit—and that’s all that’s needed.” Read the article. A new paper published in the Journal of Geology by BCAB researcher Barry E. DiGregorio and others makes parallels between manganese oxide rock varnish on Earth and on Mars. They calculated the growth rate of rapidly forming rock varnish found on rocks on the Erie Canal in Western New York State in the USA. If microbes are creating varnish on Mars in a similar way, any organic material entombed within it should be able to be detected by analyzing the manganese oxides by the Mars Science Laboratory organic analysis instrument known as SAM. Read more in the Publication of the week section. An article by Professor Wikramasinghe was published in The Island in Sri Lanka on 14 January, in which he argues that cosmic viruses “appear to have controlled the evolution of life on the Earth from the first microbes brought here by comets to all life – plants, animals, humans”. Read the article. Patrick Rowan’s Skywatch included an extensive interview with Professor Levin in an article entitled “40 years after Viking landing questions remain about life on Mars”. The interview discusses the Labelled Release experiments which Professor Levin designed for Viking, his recent proposal for high-resolution images of rocks cracked open by the Curiosity rover, and growing acceptance that Mars is not a sterile planet. He expresses his hope that “the HABIT experiment on ExoMars 2020 … will get evidence confirming that Viking detected life.” Read the article. This article by Professor Wickramasinghe was published in The Island. Please click here to read the full article. He summarises recent scientific developments, which he believes “all spell out a single cosmic truth. Homo Sapiens as a sentient species appears to be hard-wired to seek out its cosmic origins, perhaps intuitively sensing that we cannot be alone.” He writes that “over the past few years there has been a gradual realisation that life must be a truly cosmic phenomenon”. Intelligent extra-terrestrial life might be a threat; bacteria and viruses coming to Earth could bring pandemic disease affecting humans, animals or plants. In an essay published in 1999, Sir Fred Hoyle and Professor Chandra Wickramasinghe wrote that mankind’s ability to inject greenhouse gases into the atmosphere was essential to “maintaining the present advantageous world climate, the opposite of what environmentalists are erroneously advocating.” A new study published by the Global Warming Policy Forum has vindicated their climate scepticism. Read more on the GWPF website. The article in the Royal Astronomical Society’s journal Astronomy & Geophysics co-authored by Professors Bill Napier and Duncan Steel, “Centaurs as a hazard to civilisation“, has received extensive media coverage for its suggestion that the Earth is in more danger of colliding with the debris of a giant comet than with an asteroid. There have been reports of the findings in Astronomy Magazine (22 December), Royal Astronomical Society website (22 December), Daily Express (22 December), Science Daily (22 December), Daily Mail (22 December), Phys.org website (22 December), The Guardian (23 December), Sky News (23 December) and many other places. The RAS is holding a special conference to celebrate the centenary of the birth of Sir Fred Hoyle, who was President of the Society 1971-73: Fred Hoyle Birth Centennial – his remarkable career and the impact of his science. It will take place at Burlington House, London. Professor Chandra Wickramasinghe will speak on “Fred Hoyle and the foundation of astrobiology as a new discipline”. More information about the conference. The announcement that liquid water exists on Mars was accompanied by the comment that the discovery raises the chances of microbial life existing on the planet. Although we have no knowledge of how non-living matter turns spontaneously to live anywhere in the cosmos, it is a fact that Mars and Earth are intimately linked in the solar system. Over the past, four billion years comet impacts have taken place regularly on both planets, and these impacts could have brought life to both Mars and Earth from a common source. The most violent of these impacts could also have exchanged ejecta in the form of meteorites that carried viable microorganisms from Earth to Mars and vice versa. In either scenario, the newly discovered watery planet Mars and our home planet Earth would form a single connected biosphere for microbial life. This would ensure the certainty of microbial life existing in the watery environments of Mars. Max Wallis and Chandra Wickramasinghe argue in the current issue of the Journal of Astrobiology & Outreach that the first results from the New Horizon Mission to Pluto shows evidence of a fluid interior with a radioactive heat source driving mountain tectonics and surface restructuring. The presence of methane ice suggests past or ongoing biological sources. Read the full article: “Pluto’s surprises: Mountain tectonics, methane and evidence of biology”. The Daily Express (4 September) published a picture (shown on the right) from Professor Milton Wainwright’s current study in the stratosphere, showing a bull-shaped particle erupting from a crystal of salt, which Professor Wainwright believes to be an alien microbe of the sort which is continually arriving from space. Read the article on the Express website. Professor Chandra Wickramasinghe had a letter published in The Independent (8 August) putting the Rosetta mission to Comet Churyumov-Gerasimenko in the context of other research. Read the letter on the Independent website. In another letter to The Independent (3 August) he explained how new evidence supports the theory of panspermia. Read the letter: Comet evidence supports the theory of cosmic life. Read a report of the lecture, which was entitled “Extraterrestrial life and the future trajectory of humanity”, in the Sunday Times (Sri Lanka), and find out more on the Ray Wijewardene Trust website.